I am disturbed by the New York Times article on the economic panic sweeping Dubai. It’s the most popular article of the day! Must the western desire for the demise of this city result in the uncritical circulation of imagery of the non-western world? 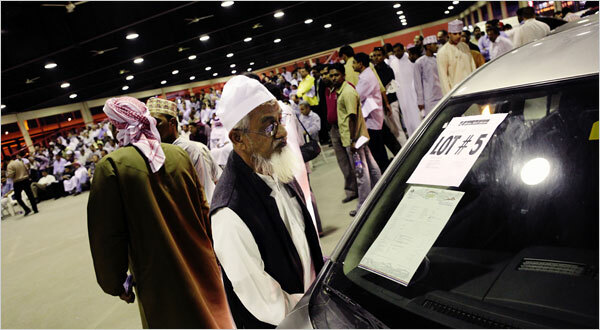 Is it just me or are these images of “post-boom” car lots in Dubai just a new form of orientalism? They’re rehashed Delacroix with Mercedes. How shocking to our sense of propriety that “3000 abandoned cars” sit in the Dubai airport. In terms of lost wealth, that is nothing compared to the trillions of dollars lost from the sloppy financing surrounding US home-ownership. But images like those above are already being circulated as “critiques” of Dubai. The criticism of Dubai is necessary and warranted, but the staging of photographs like these — as analogs for larger socio-spatial criticisms — frightens me. It seems to me that the article is attempting to describe how the financial crisis in the US has had worldwide ramifications. And the case in Dubai is unique because it had created a vortex in its own growth. When you promote the city as being built upon things as hollow as “real estate, finance, and tourism,” the images of Dubai abandoned should not come as a surprise. If anything, we should be more aghast of the previous imagery of a city gone mad. Our orientalist overtones posited Dubai’s society as a people with so much money that they had lost their minds and were building just to be sensationalist. I also had wondered how with so many building projects in Dubai, where were the beautiful ones? I’ve seen awe-inspiring size, but beauty? I’m still waiting.